A NEW film will shine the spotlight on Scotland’s southern scenic railway to visitors across the Atlantic. VisitScotland has teamed up with leading online travel and lifestyle publisher Matador Network to produce a two-minute film to take people deep into the heart of one of the less explored regions of the country. The new film – which has already received more than 600,000 views - has been developed to support the Borders Railway and inspire visitors from the US to explore Midlothian and the Scottish Borders on a trip to Scotland. The film will be promoted on the Matador Network’s digital channels in the coming weeks with the activity guaranteed to deliver upwards of 550,000 views on the web’s largest independent travel media site. The film is the latest activity in VisitScotland’s three year £367,000 marketing campaign to put the Borders Railway on the map. The funding provided by the Scottish Government, Scottish Borders Council and Midlothian Council, is being used to promote the Borders Railway to national and international markets. 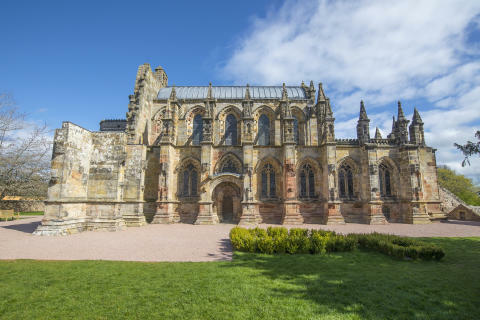 Featuring some of the most memorable scenery and sights stretching along the 30-mile route from Edinburgh to Tweedbank, the film takes viewers on a journey into new landscapes to discover iconic attractions such as the home of Sir Walter Scott at Abbotsford House, Floors Castle in Kelso, Jedburgh Abbey, Rosslyn Chapel and Edinburgh Castle. It also features some of the adrenaline-inducing feats and activities that can be enjoyed in the regions, from mountain biking and high-wire assault course at Glentress Forest to falconry at Dalhousie Castle and fishing at Bowhill House and Country Estate. VisitScotland Chief Executive Malcolm Roughead said: “The Borders Railway has had a massive impact on the local economy and has encouraged people to come and visit this part of the country from all over the world. The momentous re-opening of the historic route last year by HM The Queen captured the attention of the world’s media. We want to build on this momentum and continue to shine a spotlight on the regions surrounding the Borders Railway which are now easier than ever before for visitors from the US to explore. 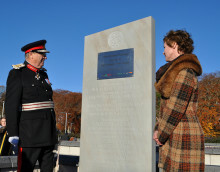 A commemorative stone sculpture has been unveiled at Tweedbank Station to mark the day Her Majesty The Queen opened the Borders Railway and became Britain’s longest serving monarch.